How many times have you read that, or something like it, in a writer’s biography paragraph at the front of a book? How many author photographs have you seen with the distinguished man or woman of letters cuddling an unprotesting feline? 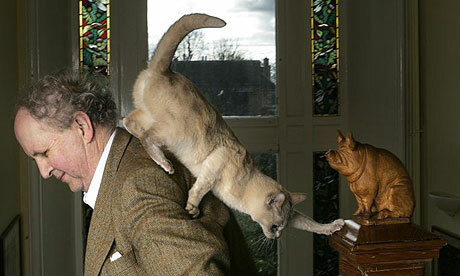 Just what is it about cats that makes writers think we need to know they have an affinity with them? What is it about cats and writers? That’s easy. Cats encourage stillness. They settle on your lap when you’re sitting on the sofa drinking a cup of tea; if you have no book to hand, you have to roam amongst your own thoughts rather than filling your mind with the thoughts of others. Cats creep onto your lap when you’re at the keyboard and fall instantly asleep. You have to stay at the keyboard while they whiffle through their mice-hunting dreams; you end up writing an extra 300 hundred words. I have three cats inside…Misha, Mocha, and Joseph. All rescues. I have five “patio cats” who have found my backyard their own safe haven. I have spayed and neutered three and all have shelters. Two have been with me for 10 years. Their world is an outdoor world. They have never wanted to come in. I love them all dearly. I tell Joseph that he can never leave as he owes me too much money. I found him four years ago on Christmas Day and badly injured. After spending lots of $$ to have his jaw wired back in place, and feeding him homemade cat food gruel for three months, he has healed well and is my loyal companion.Given all the adoration said for my cats, I am a dog person. As I raked out back today with what little energy I have, I really missed my Corgi who died of cancer and my border collie pup ,Rocket. And as the Universe spins in unexpected ways,Rocket is now living with a family with a Corgi.Animals can be such an important connection into ourselves and have always given me such pleasure. I am going to post a photo of Rocket on our shared site.Today was glorious where I live. I did have to haul in my Plumerias as the temps are to drop fast overnight. Zack had a special talent, a special paw combination on the keyboard that I’ve never been able to replicate, for deleting files. He once cost me well over an hour’s fiddly work on a sound file, boof, gone. No copies left anywhere. I honestly don’t know how he did. He did it with my earliest chunk of Hild–but fortunately by then I had Carbonite, so I was able to fish out an earlier iteration from the fizzosphere and not have days and days of work lost.Is there some kind of Master Delete key combo, in Windows? (It’s not just a Word thing because he did it in Nero, too.) Because it’s a power Zack truly possessed and I kind of want to know how he did it. Any geeks out there (or cats) who know how? I’ll have my sweetie check it out on her computer tonight. In a previous life she used to be a computer tech support person.Magic cat paws…interesting. Dear Zack! He probably stepped right in the middle of CTRL-ALT-DEL (the 3-finger salute). That dumps your open program and any unsaved data. Oops! We have a wonderful picture of the composer Henry Cowell on our web site. He is sitting at his table writing notation while his cat is draped over his left arm and most of the music pages. Our 3 sweethearts (Nana, Channing, and Quinn) did this to Art all the time. We miss them … I guess we always will. And along with them, Zack. As soon as I write their names (or speak them) I cry. janine, bluenote, if you can figure out how he not only took down the open file and temporary backups, but the permanent file on the hard drive, I’d be grateful. I can’t figure it out. I think it was just kitty magic. So, let’s get more information. I’m geeking out here. Start with Word. Was the document open and were you in Word when it happened? I was in Word. I was working. Zack jumped on the keyboard. Zzztt. The window disappeared. (When I’m writing I maximise the window to full screen.) The file was gone. Gone. I thought I was going to burst something. Fortunately I had an old version on a flash drive from the night before, and Carbonite had backed up for me that morning, but the file itself was just…gone from the hard drive. Unbelievable. I got Kelley to come and check for me just in case I was having a brain spasm but, no, it was gone. She retrieved it from Carbonite (I was just blinking in shock; the cat was cleaning his whiskers). If it hadn’t actually happened to me (and once before, about five years ago–in Nero rather than Word) I would have said it was impossible. Okay…there might be a number of possibilities. Just to make sure, what version of Windows and Word did you have at the time?Believe it or not, this is actually fun! Windows = XP (dunno what subvariety, but I consciously do all the updates, and the Great Deletion Incident occurred about a year ago), Word = 2003 version, whatever that is. You should have a list of possibilities in your inbox, Nicola. Thanks for the opportunity to geek out!